We deliver gravel, screened topsoil, compost, sand, fill dirt, crushed stone, and more. Scott Snyder Dump Truck Service provides a more customer-focused, personalized service. One of the many advantages of working with a smaller company: not only interested in providing top notch products, but services that are designed to appeal to the homeowner and developers alike. Scott Snyder Dump Truck Service is capable of assisting with many types of trucks for your brokerage needs as well. Established in 2006, we are a privately owned, local business that supports the local community. Scott Snyder Dump Truck service is a Toledo-owned dump truck business. We do our best to supply the needs of home owners and commercial accounts in short order. 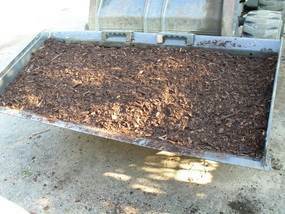 We deliver driveway gravel, topsoil, sand, mulch, and compost. We also do new installations and repairs of gravel parking areas and driveways. 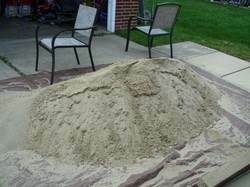 Quick and easy delivery of all grades of sand and stone. There is no minimum, and you can get better deals with larger bulk purchases. A nice pile of Rich Black Dirt purchased from; Holland, OH Excavation site. 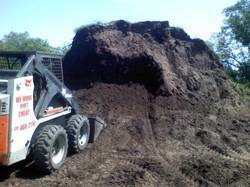 We can deliver everything from compost to fill dirt. Call Scott today to get a quote!